Joy Radio has made a return to the airwaves broadcasting via the net 24/7 playing Jazz, Funk and Soul. In 1988 the line up of presenters included Noel H,DJ Mellow, Osi Os, DJ Submariner as well as Micky T, DJ Dex, BW and Mr Vee . Still broadcasting at weekends there were odd gaps in transmissions due to changes in studios with the odd transmitter raids. 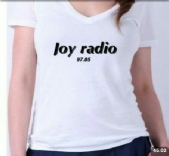 In 1989 Joy Radio went from strength to strength. From a studio close to Crystal Palace it was broadcasting every weekend from September through to the beginning of December without a single raid, a total of 12 weeks.